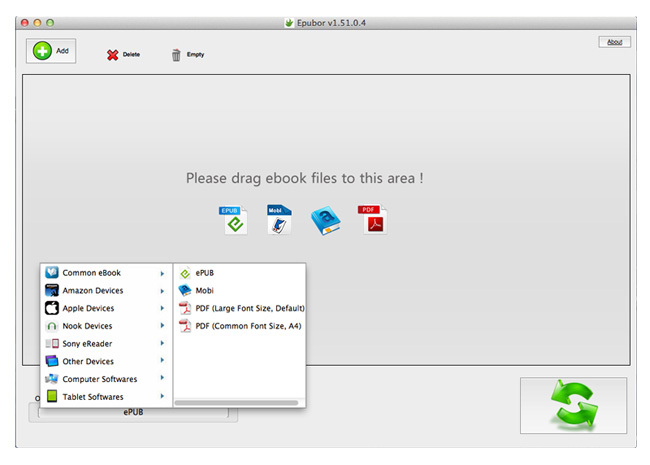 pubor eBook Converter for mac is a one-stop eBook converter for you to convert different eBook format, include ePub, PDF, MOBI, AZW, AZW3, PRC, etc. With this powerful free trial software, you can convert ePUB books to PDF format, convert PDF to ePUB, or convert Kindle books to ePUB, ePUB to Kindle, Kindle books to PDF format, etc, and read the converted eBooks on Kindle, Kobo, iPad, Nook, Sony Reader without limitation. High quality conversion. Convert your eBooks to other formats with high quality, no content loss, greatly guarantee reading effect. And the output eBooks can automatically fit the screen size of your readers that you selected in the previous step. 5X faster conversion speed than General. Convert one eBooks within seconds, convert dozens of eBooks within minutes. Save much of your time. User-friendly interface and Easy to use. Straightly drag and drop or manually add eBooks on your Mac into this awesome program, then choose your desire output formats, click the conversion button to get converted eBooks. Edit eBook Metadata. Users could edit all the important meta data of books, include eBook cover, Title, Author, Publisher, and Language. Output devices included series e-readers of Sony, Kindle, Nook, Kobo, Apple and PC e-readers such as Kindle for PC, ADE, Kobo Reader, etc. 2) Bunch of bugs fixed and performance improvements. 512 MHz CPU or above, 128 MB RAM or above. Update conversion code, easier operation interface.